It’s been a busy winter here at CUMAC, but 2018 is off to a great start! We've added several staff members to the team and we're very excited about it. Join us in welcoming Eileen Marrero (Receptionist), Nathaniel Simms (Driver), Al Battle (Warehouse Assistant), Jeni Mastrangelo (Pantry Assistant), Kayann Foster (Volunteer Coordinator), and Gabe Melendez (Pantry Doorman)! Many of our new team members have been part of our work for awhile (through AmeriCorps or the Pathways to Work program) so we’re especially thrilled to now have them on board as employees. We have big goals for 2018, and with a growing team we’re confident that we’ll be serving our community in new and exciting ways this year! Feeding thousands of hungry clients every month means that food must be picked up on a daily basis. CUMAC has a driving team that makes it possible, but with an aging fleet of vehicles, the staff made acquiring a replacement truck a top priority in 2018. Thanks to a generous grant from the Order of St. John Commandery of New York and a generous donation from the Soechting family, made in memory of their mother Elisabeth, CUMAC recently purchased a new truck that will help the organization transport food and other vital resources for the next several years. This was welcome news for CUMAC’s Senior Driver, who spends most of his days behind the wheel, collecting and distributing food around the community. “We take good care of our vehicles, but with a truck that’s almost 20 years old, I dread that one day I’m going to be stuck on the road” says Salino. “With this new truck, I feel much more secure. It’s a great feeling.” Bert is particularly excited about the ability to drive further on his daily routes to get items that clients will enjoy. The process of finding a truck took several months for CUMAC, as the staff searched for vehicles that would fit the organization’s unique needs. CUMAC regularly picks up large donations, often full of perishable items like produce and meat, so keeping these items fresh is essential. Supported by Wayne Morse of Enterprise Rent-A-Car and Rick McLaughlin of Trucksmart Isuzu, CUMAC was able to find a truck with a refrigeration unit and plenty of space to handle the team’s busy pick up schedule. CUMAC served over 30,000 people last year through its pantry and mobile pantry, and because of the volume of fresh produce and baked goods that we receive we were able to provide surplus fresh food to an additional 35,000 others. A reliable, refrigerated vehicle is integral to our ability to transport and process over half a million pounds of fresh produce annually. This vital piece of equipment ensures that we can provide the fresh, nutritious food that our clients rely on to keep their families healthy while also staving off hunger. CUMAC’s new 18 foot box truck will arrive later this month and will immediately be put to use, transporting resources from various groups, businesses, and partners throughout the area. 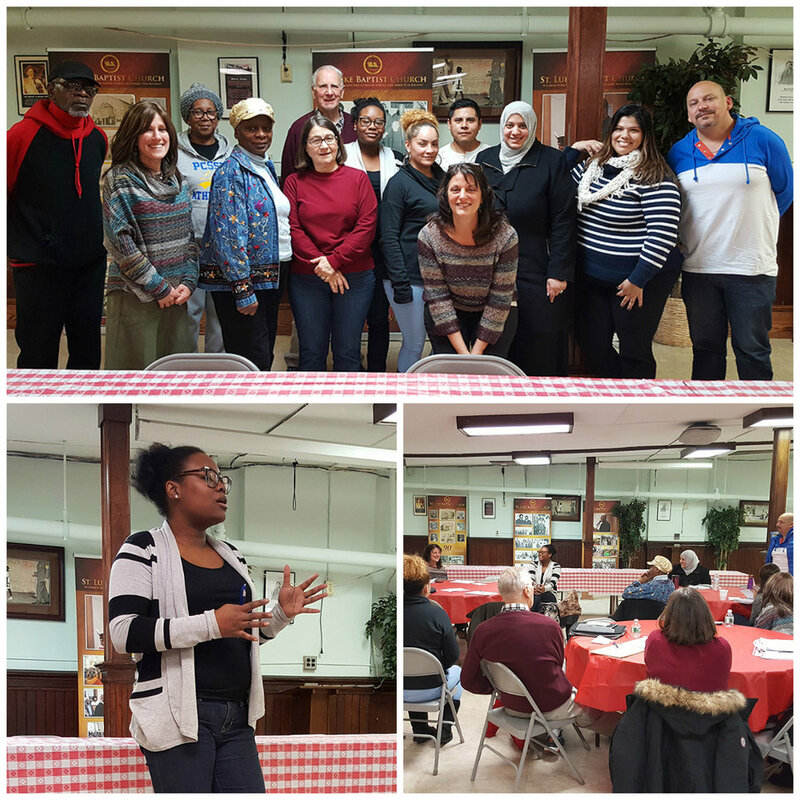 CUMAC is teaming up with Passaic County Community College's Food Service Training program to teach our clients about cooking and food safety through monthly food demos. Led by Chef Robert Ekert, the PCCC team cooked and served a menu at CUMAC made completely from the rescued foods given out daily in our pantry. This month's topic: what to do with leftover bread. 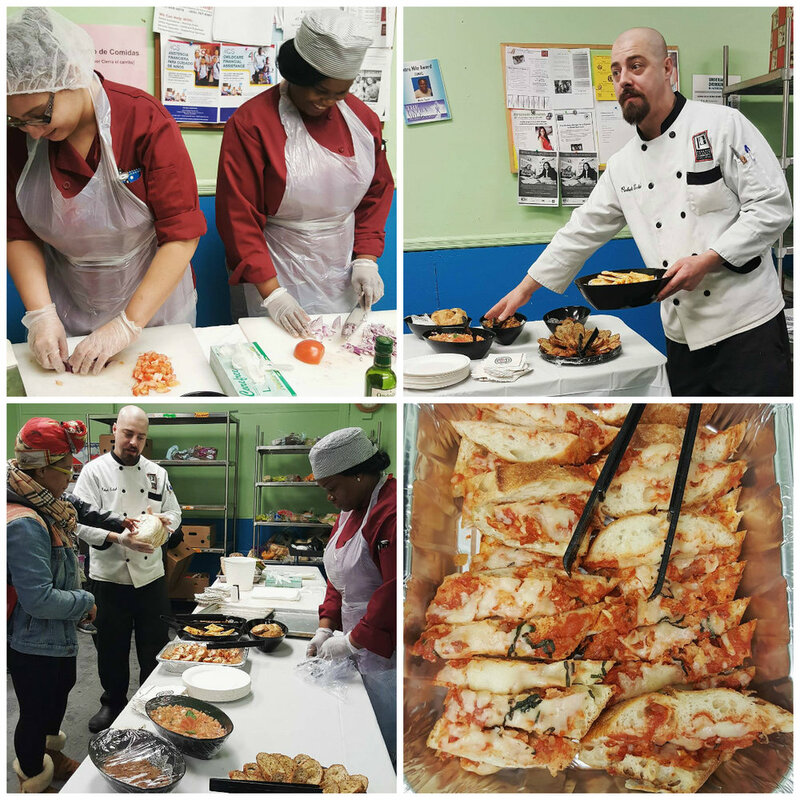 Chef Robert and his team showed our clients how to make bread crumbs, croutons, pizza bread, bruschetta, and much more. Clients then had the opportunity to sample these foods, ask questions, and learn more about the FST program. It was educational, delicious, and a huge hit with our clients. Thanks to our friends at PCCC for being a partner in our work! We'll be having food demos in our pantry every month so look out for updates in the weeks ahead. We're already looking forward to our next demo, which will highlight fun ways to use leftover produce items! See more photos from PCCC's visit. To learn more about PCCC's program please call Jim Hornes, Director of Food Service Training, at 973-684-5757. It’s 9:30 am and our driving team is getting back from their first route of the day. “500 pounds of fruits and veggies” says our driver, Bert. “Nice way to start the morning!” This may seem extraordinary, but for the staff of CUMAC, it’s business as usual. Every day you can find our trucks on the road picking up food to help feed the hungry. Those fruits and veggies, rescued from a local supermarket, are quickly brought into our warehouse, where they are sorted and packed into grocery bags by our team of volunteers. By 11:00 am those bags are moving into our pantry, going straight to clients who desperately need them. Last year CUMAC provided 35,000 people with food through our food rescue efforts alone. This year we hope to reach even more people. We’d like to thank all of our supporters for making it possible. When you donate to CUMAC, you help fuel our trucks, you power our refrigerators, and you help ensure that thousands of families around our community have the ability to provide fresh, nutritious meals. Together, we’re creating a happier, healthier community. Thank you. Eileen started with CUMAC through the Pathways to Work program a couple of years ago. She was going through a rough time in her life. After 20 years of working in administration, she lost her job and struggled to find a new one. She joined the Pathways to Work program hoping that the experience may lead to a new job. With a 5 year old at home, all Eileen wanted was to go back to work to provide for her family. But soon the bills started to pile up and Eileen eventually lost her home. She stayed in the shelter for a couple of months and bounced around for awhile after that, finding different places to stay while she got back on her feet. She remembers walking on the highway to get to interviews, regularly asking for rides, and often taking several buses to get where she needed to go. For Eileen, that was one of the scariest moments of her life. She had always been able to take care of her family but suddenly at 40 years old her whole world turned upside down. She feared that she and her son would be left out on the street. It’s amazing to think that while Eileen faced homelessness and constant instability, she was always a model Pathways member, reliable and dedicated. She kept applying for jobs with no luck, but through it all she stayed positive and worked hard. 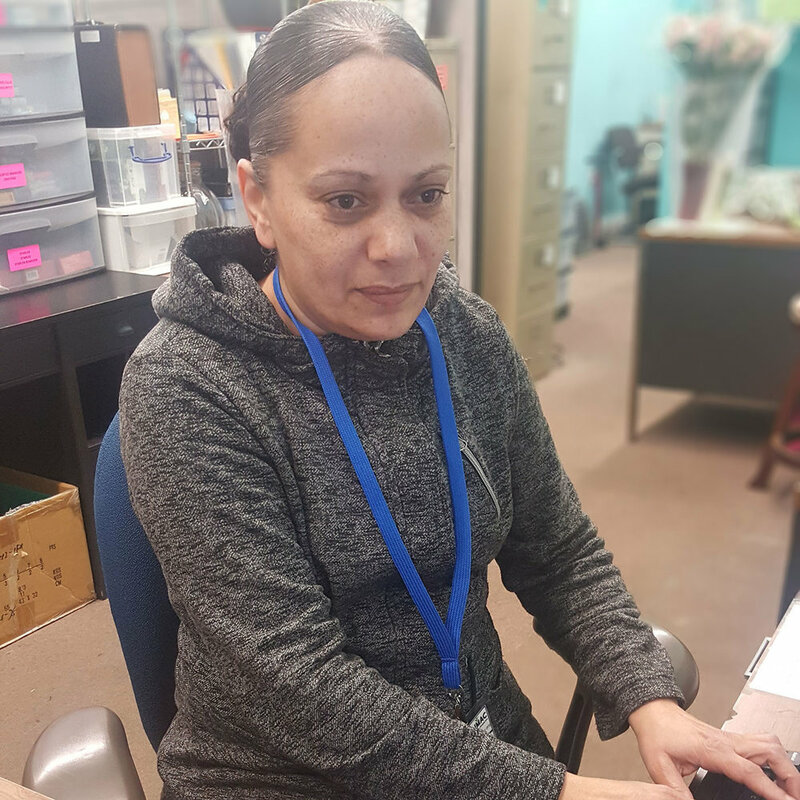 Our staff took notice and when a position became available in CUMAC’s office several months later, Eileen was immediately recommended by several team members. “I’m going to give you 150%” Eileen said in her interview. Since she was hired, she’s been doing just that. She’s quickly become an asset to the CUMAC team, assisting with everything from deliveries and scheduling to data entry and programs. Eileen, we couldn’t be more thrilled to have you on board. We know you have a bright future ahead. Welcome to the team! CUMAC would like to send a big thank you to Shop Rite’s Partners In Caring program for their continued support of our mission. Since 1999, Partners In Caring has supported over 2,000 hunger fighting agencies in the U.S. and CUMAC is thrilled to be one of them. Through Partners In Caring, customers at ShopRite and ShopRite affiliated grocery chains can donate directly to CUMAC at every register. All proceeds are issued to CUMAC as a credit that can be used to purchase food at the Community Foodbank of NJ. With our staff buying food in bulk at an incredible $0.18 per pound, CUMAC is able to maximize every dollar donated and do even more for our clients. Partners in Caring donations also allow us to purchase items we are low on so that we can continue providing balanced meals to our neighbors in need. For instance, CUMAC recently ran out of canned protein and the ability to shop at the food bank was instrumental to replenishing this important item. CUMAC would like to thank Little Falls ShopRite, Palisades Park ShopRite, Lyndhurst ShopRite and Paterson PriceRite, and everyone that supports the Partners In Caring, for collectively donating over $6,000 in credit last year, enough to purchase over 35,000 pounds of food! The coalition met earlier this month and there was plenty to discuss. Several CFC agencies have recently switched over to new software, which allows them to handle client intake electronically, something that CUMAC has been doing for the past couple of years. This new system, provided by the Community Foodbank of New Jersey, is exciting for our partner pantries, but there's also a bit of a learning curve. Fortunately, the meeting is an opportunity to ask questions about the software and learn more about the process. It's also a chance to get some feedback about the program. Initial responses have been overwhelming positive. “I hate paperwork” says one CFC member when asked about her pantry's old intake process. “This software makes life simple for me.” Along with speeding up client intake and cutting down on paperwork, the new software gives pantries the option to easily track their data and receive comprehensive reports. As pantries try to plan ahead and better serve their clients, these reports make a big difference. After discussing software, the meeting changes focus. CFC members engage on a wide range of topics: one pantry is now distributing diapers for the first time and wants to know best practices, another group has an excess of pallets and they’re looking for ways to get rid of them, while several others talk about the needs of their clients and some additional services that can be provided. The hour quickly passes as pantries talk about their experiences, ask questions and give advice. The meeting ends with some thoughts about a healthy produce program, spearheaded by CUMAC, where fruits and vegetables from the Food Bank are shared with CFC members twice a month. The food is picked up and delivered, and allows pantries to get healthier items to the hungry on a regular basis. The produce program has been a huge hit with the CFC, and it’s just another example of how agencies are coming together to ensure that client needs are being met across the county and area. By regularly communicating, CFC pantries are in a better position to serve our community. We’d like to thank the CFC pantries for all that they do for the community. Together, we’re helping keep our neighbors hunger-free. Passaic County pantries interested in working with the CFC can call (973-742-5518) or e-mail Rose Bates to learn more about the coalition. This article originally appeared on the CUMAC blog. Be sure to check our blog for more CUMAC stories and updates. Volunteers needed! CUMAC is looking for individuals and groups to help sort, pack, and distribute food (Monday-Thursday). Volunteers are also needed to assist our drivers with their daily pick ups. If you’re interested in getting involved or want to learn more please contact call (973-742-5518) or e-mail us. CUMAC’s Community Closet is in major need of blankets, pillow cases, bedding, baby items, girls and boys clothing, suits, shoes, spring and plus size clothing. Want to help? Consider donating your new or gently used items this month. Every donation can help someone in need! 10% of your bill will be donated to CUMAC – must present flyer! October - more details coming soon!